Absolutely beautiful home with 5 Bedrooms and 4 bathrooms. Finished full walkout basement, exercise room (used as a quilt room) with huge closet, Pub style wet bar with beautiful cabinets, refrigerator and wine room. Powder room, 2 bedrooms in basement with a lovely bath including granite countertop and tile floor. From the moment you enter through the custom wood and glass front door you will be surrounded by an abundance of upgraded features including gorgeous wood flooring through the main living area that were refinished in the last year, richly finished knotty alder cabinets and built ins, appliances include gas cook top with pot filler and double ovens. A large concealed walk-in pantry makes cooking and storing easy. The view to the great room is breathtaking with a massive wall of knotty alder built ins, custom designed TV cabinet with paneling and moldings to the ceiling and surrounding the gas fireplace. Three eating areas include large breakfast island, large formal dining room and a sunny breakfast area overlooking the backyard and screened in porch. (complete with ceiling fans) Remote window treatments in living & nook. Newer shades in dining room, living room, master bath, master bedroom. River rock and white rock added to landscaping...keep the mulch cost down! Landscaping has been updated and freshened. The utility/mud room has many built ins and a New England style bench w/drawers and wood paneled walls with hooks for jackets. The lower level family and Rec room with 9' ceilings are spacious and great for parties with game area and Pub Wet Bar as well as a guest powder room. One wall is completed with reclaimed barn wood to showcase your big screen TV. Lovely natural light...but you want to watch a movie in the day? Close those beautiful custom made, stained to match plantation shutters. Just perfect to create a large entertainment movie area! (Shutters for bedrooms as well) The office/bedroom has a custom stacked stone wall and custom paint. so inviting and interesting! The bedrooms are tucked around the corner down the hall and share a lovely hall bath. 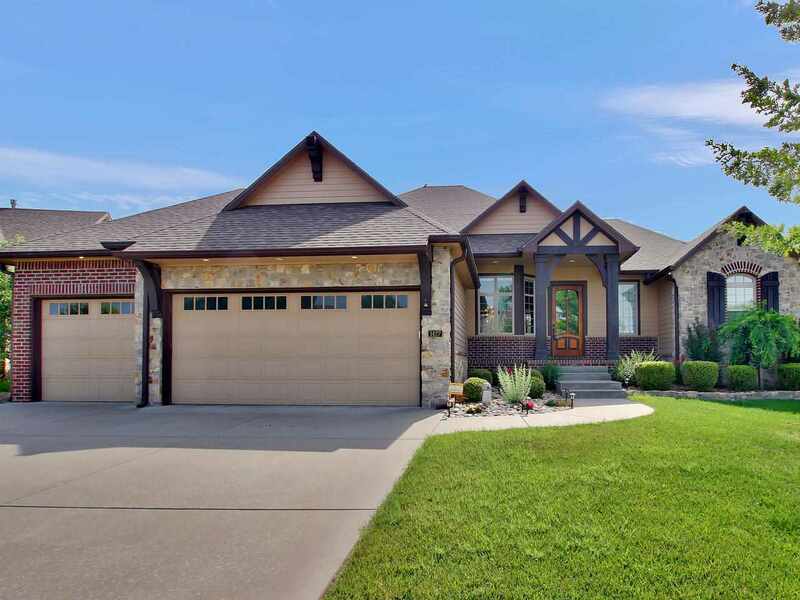 Located in popular Montana Hills just minutes away from Andover Schools, Massive grocery, shopping, dining and all the amenities of Andover and Wichita! New Roof in 2012 and upgraded to 6" gutters, main floor interior walls painted 2017, custom paint in boys room, new fans, deck stained 2017. New Hot water heater 2017.